of students. This textbook is suitable for individual study or for a variety of course formats: lab, self-paced, lecture, group or combined formats. 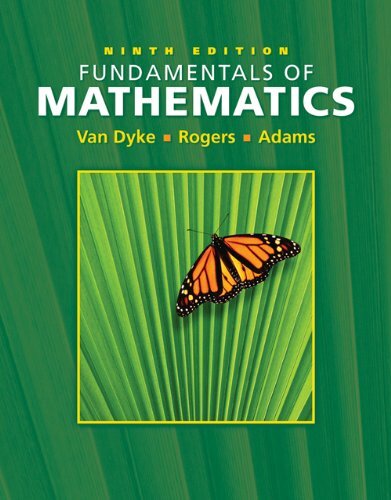 Though the mathematical content of FUNDAMENTALS OF MATHEMATICS is elementary, students using this textbook are often mature adults, bringing with them adult attitudes and experiences and a broad range of abilities. Teaching elementary content to these students, therefore, is effective when it accounts for their distinct and diverse adult needs. Using Fundamentals of Math meets three needs of students which are: students must establish good study habits and overcome math anxiety; students must see connections between mathematics and the modern day-to-day world of adult activities; and students must be paced and challenged according to their individual level of understanding. James Van Dyke has been an instructor of mathematics for over 30 years, teaching courses at both the high school and college levels. He is the co-author of eight different mathematics textbooks, including Fundamentals of Mathematics, published by Cengage Learning. Community college Mathematics Instructor - 18 years, Portland Community College. Co-author - 2 mathematics texts.